Washington wages direct and proxy wars dirty. Favored allies are cold-blooded killers. Cutthroats are America’s favorites. The more vicious the better. America’s so-called responsibility to protect (R2P) is a license to brutalize and kill. Pro-government loyalists were targeted. Assad was wrongfully blamed for terrorist killings and atrocities. It wasn’t the first time or last. Weeks later, death squads murdered dozens of Treimseh civilians. Assad was again blamed. Western and UN Human Rights Council reports were fabricated. The mainstream media repeated them like gospel. Facts don’t interfere with propaganda. It’s standard policy. “They do the ugly work.” He believes in violence, he explained. He “cut the throats of four men.” He machine-gunned many more. Executions happen regularly, he said. Assad loyalists are targeted, brutalized and murdered. Women and children aren’t spared. Der Spiegel’s “executioner” article explained. The publication said little more by way of follow-up. 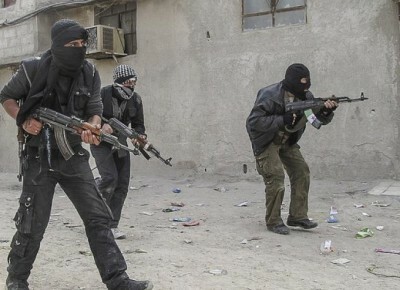 Last March, Human Rights Watch also reported on Syrian “Armed Opposition Groups Committing Abuses.” An “Open Letter to the Leaders of the Syrian Opposition” accused them of targeted killings, summary executions, kidnappings for ransom, torture, hostage taking, and other violent crimes. HRW’s moment of truth didn’t last. It’s a reliable imperial ally. Amnesty International and similar groups replicate its anti-Assad propaganda. They’re well funded to support US interests. Attacks occurred on three Saraqeb checkpoints. They straddle Syria’s main north/south highway. Even Assad opposition supporters can’t hide what happened. Video evidence showed it. “Accountability will follow,” he added. How and in what form he didn’t say. Expect little more than rhetoric. Throughout the conflict, Washington Post reports have been consistently one-sided. This time, fingers pointed the right way. “Syrian rebels execute unarmed government soldiers; dozens killed in fighting,” it said. Summary executions happen regularly. Soldiers and pro-Assad loyalists are targeted. Video posted online Thursday was filmed at Saraqeb’s Hamisho checkpoint. The term refers to pro-Assad fighters defending Syria against Western-recruited death squads. In other words, they’re anti-imperial resistance fighters. Western reports call them terrorists. AI consistently is anti-Assad. Harrison’s comments were less than fully forthright. She and other AI staff regularly blame Assad for death squad killings and atrocities. America can easily stop conflict by calling off its dogs. Peace and stability undermines its imperium. Violence furthers it. Hired guns are used for that purpose. Syria’s being ravaged and destroyed. Olive branches Assad extends are summarily rejected. Despite convincing evidence disputing him, he thinks Syria can be “saved from destruction and national disintegration.” What are the obstacles, he asked? Deep wounds must be healed. How can they be when Washington won’t let them? Seale admits there’s “no readiness for reconciliation on either side.” He’s half right. Assad wanted it since last year. Repeated overtures were rebuffed. Seale is right saying Syrians and other regionally must choose who’ll rule them. Intervention in the internal affairs of sovereign countries violates international law.